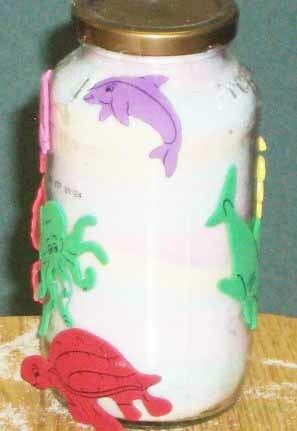 This post has a colored salt art jars project how to with an ocean theme. 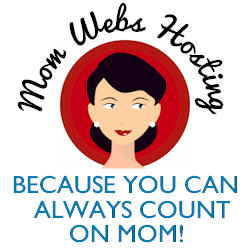 A free illustrated step by step PDF and a free Power Point are included with step by step directions. Color chalk is used to color salt for this project. The trick is to have enough salt on hand to totally fill each jar to the very top so the layers of colored salt remain in place when the project is final. Begin by offering the children a selection of colored sidewalk chalk. It doesn’t have to be new chalk. The brighter the colors, the better, although these pastel colors worked just fine. Then the children will spend some time concentrating on pushing the chalk around on the salt. A variety of different kinds of salt will help enrich the experience. 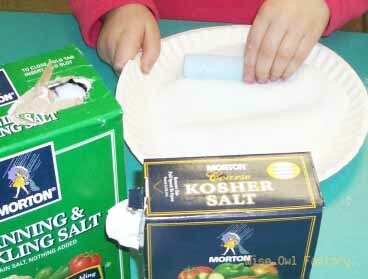 Kosher salt will work faster than table salt. 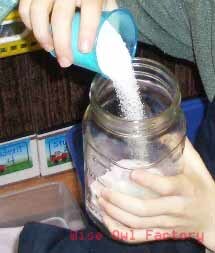 Many students wanted to use ice cream salt. 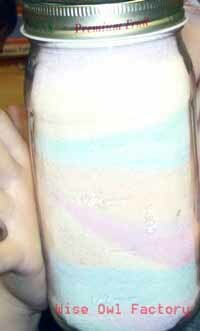 Ice cream salt sounded appealing but was difficult to work with for the children. 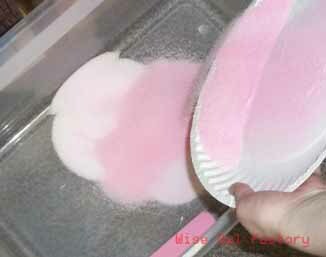 Each finished plate of colored salt is poured into a temporary container for scooping into jars with small cups and plastic spoons. 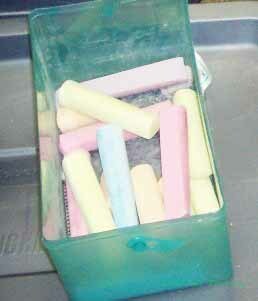 Each color requires a separate temporary container. Here are three containers ready for the next step, layering colors into jars. The children will scoop the colored salt into jars. Tilting the jars to different sides for different will add dimension to the layers. The jars must be filled to the very top with salt or as the jars are carried around, the colors will blend and the entire jar will be a dull gray. An added step would be to push the sides down with thin pencils, to add some drama to the landscape appearance. Finished jars may be decorated with ocean foam stickers.